Always nice to see what Nicolas Cage is up to. 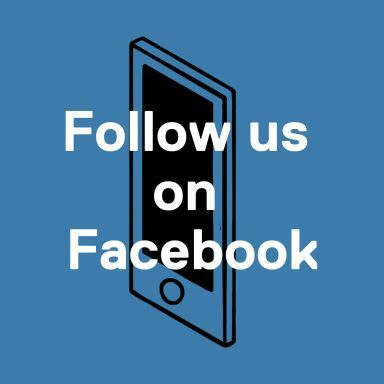 If this is Hell, send us there. Nicolas Cage is screaming. His face is contorted into a grotesque, Edvard Munch-adjacent portrait of soul-deep pain and anger, so potent that if you close for your eyes for a moment, you might be able to taste the bitter metallic tang of the blood streaked across his cheeks and matted in his hair. It’s this full-bodied commitment to his craft which has made Cage an enduring presence in Hollywood for some three decades. 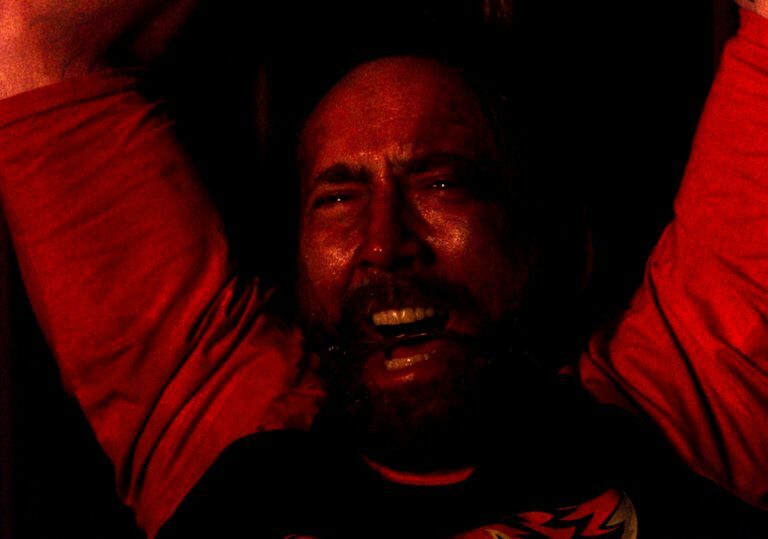 His performance as Red Miller in Panos Cosmatos’ cosmic revenge romp Mandy is a testament to this resilience, but also transcends Cage’s whirling maniacal trademark performance style to become a different sort of beast. It’s 1983 in the Mojave Desert’s Shadow Mountains. Red lives a peaceful life with his partner Mandy (Andrea Riseborough) near Crystal Lake. They while away the hours quietly, until strange dreams start to plague them, foreshadowing something wicked heading their way. When the leader of a violent religious cult takes an interest in Mandy, their rural idyll is shattered, turning a woodland reverie into a blood-soaked vision of Hell on Earth. The aptly named Red swears revenge on those who have wronged him, including the cult’s biker minions, who look like they’ve just walked off the set of an Iron Maiden album cover shoot. Despite its fairly linear revenge movie plot, Cosmatos’ twisted fairy tale – steeped in heavy metal iconography – is quite unlike anything else you’re likely to see at the cinema this year. Once the action starts, there’s no let-up, no respite. 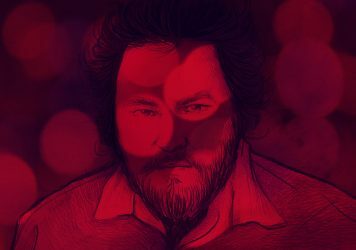 With a hefty dose of ultraviolence in the form of mind-boggling set-pieces involving battleaxes and chainsaws, Mandy has the same stylistic look and feel as Craig S Zahler’s recent gore-fests Bone Tomahawk and Brawl in Cell Block 99, but thematically it’s closer to a moodier, LSD-tripping cousin of David Lynch or Jim Jarmusch. The ethereal visual atmosphere sees grainy shots bleed into one another like a reel of film exposed for too long, and shifting red-blue-purple lighting brings to mind the chemical headache of hours spent in a darkroom. Elsewhere, the late, great Jóhann Jóhannsson’s brooding score – vastly different from any of his other work – provides a stark reminder of just what a tragedy his loss is for the film world. This, coupled with King Crimson’s remarkable track ‘Starless’ from their 1974 album ‘Red’, creates an unforgettable acid-trip soundscape that bores into your skull. When one character remarks to Red, “You exude a cosmic darkness,” he isn’t lying. Cage’s full-tilt performance sees him snort cocaine from a large shard of broken glass and light a cigarette off a decapitated skull, but in fully investing us in Red and Mandy’s relationship from the off, Cosmatos marries Cage’s knack for mania with his often under-utilised ability to be thoughtful and restrained. It’s not so much Peak Cage as Prime Cage. 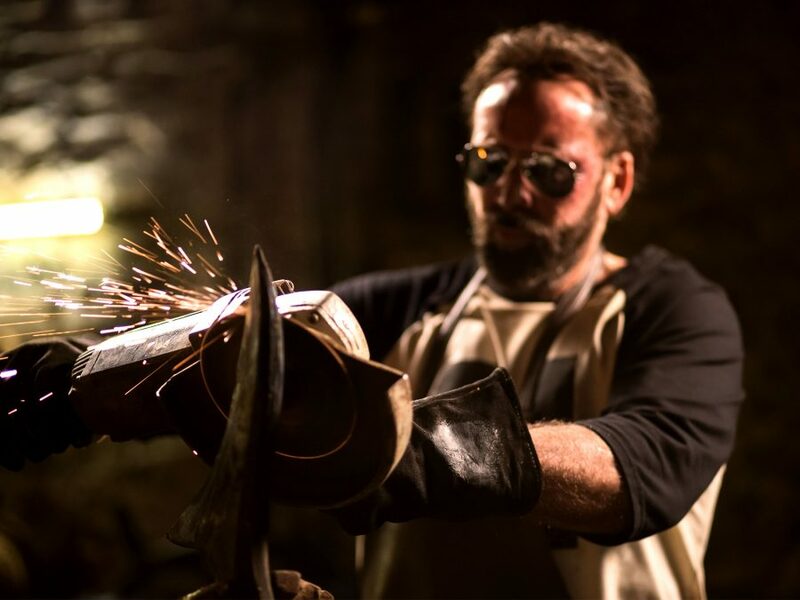 Even those who can’t get on board with the film’s jarring brutality will be hard-pressed to fault Cosmatos’ singular vision – or the incredible sight of Cage hand-forging a weapon he christens ‘The Beast’. An unabashed and compelling case for the beauty of genre cinema, Mandy will continue to haunt you with its curious blackness even when the swirling, waking nightmare is over. Nicolas Cage and Selma Blair are struck by mass hysteria in this lunatic horror-thriller from director Brian Taylor. A wildly entertaining off-kilter crime thriller from the dream team pairing of Werner Herzog and Nic Cage.